Investing in real estate is a risky business venture that requires attention to detail, quickness and efficiency. It is very important to choose the correct creditor: one that is committed to you and your investing future, not just their own profits. 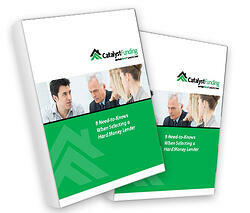 This white paper dives into 8 questions to ask when choosing a hard money lender! Do you help generate a detailed ARV estimate? Do you provide a detailed, itemized list of ALL closing costs? Preapproved with Us & Need to Estimate a Project? Count on Catalyst Funding for the hard money loans, wholesale properties and investor guidance you need to accelerate your future in real estate.